Many people with diabetes are concerned about eating eggs because they believe they are too high in cholesterol. It was once believed that eating dietary cholesterol could increase cholesterol in the blood, but this logic is no longer thought to be true. In fact, studies have shown that dietary cholesterol, like the cholesterol found in eggs, is not linked to high levels of cholesterol in the blood. While it is not uncommon for a person with type 2 diabetes to have other conditions like high cholesterol, dietary cholesterol consumption itself has not been linked to elevated blood cholesterol levels. As for an overall relationship between egg consumption and type 2 diabetes, a June 2010 study published in the Journal of Clinical Nutrition found no such relationship. Some experts recommend limiting eggs to no more than three yolks per week. This recommendation is mainly due to the saturated fat content found in the yolk rather than the cholesterol. Excess intake of saturated fat (found in fried foods, process meats like sausage and bacon and sweets such as cookies, cake, and candy) can raise your blood cholesterol. And while two eggs have less saturated fat than a small hamburger, if you cook your eggs in butter, top them with full-fat cheese or pair them with bacon or sausage, you are bound to eat too much saturated. In fact, some study results have shown a link between egg intake and high cholesterol or diabetes may be skewed based on the presence of other high-fat breakfast items like butter, bacon, and sausage. On their own, eggs are a moderately lean protein source that can help balance a meal plan made for someone with diabetes. Protein is an important macronutrient that helps to aid in satiety, preserve and build lean body mass, boost immunity and helps heal and repair tissue. Eggs contain no carbohydrate and have limited to no impact on blood sugar when eaten alone. Egg whites are an even leaner option: two egg whites or 1/4 cup egg substitute have half the calories of 1 egg and are extremely low-fat. Scramble one egg and two egg whites. Add any non-starchy vegetable to your scramble—leftover roasted vegetables, spinach, pepper, onions. Serve egg scramble on top of 1 slice of whole grain toast with a smear of avocado. Add a serving of seasonal fresh fruit. Mix two hard-boiled cooked eggs with one egg white with avocado and serve with a slice of lettuce and tomato on whole-wheat toast. Add a serving of seasonal fresh fruit. In addition to being low in saturated fat and full of good-quality protein, eggs are also packed with 13 essential vitamins and minerals — two of which, choline and lutein, are important for brain and eye function. 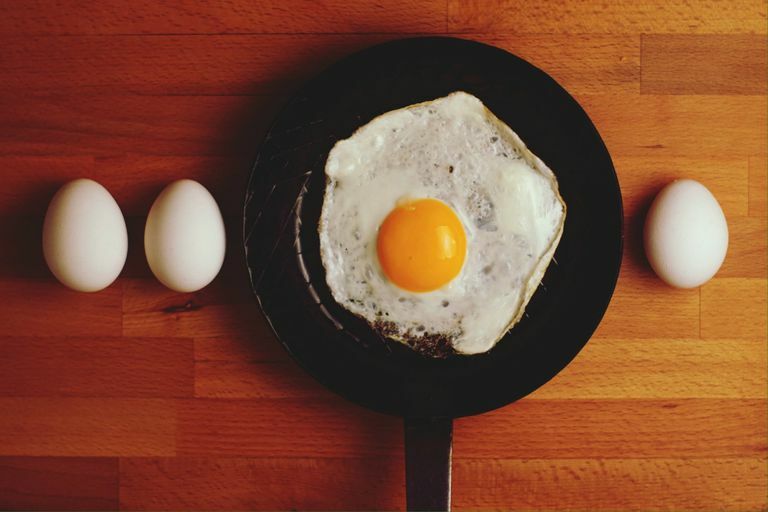 Eggs are a good source of fat-soluble vitamin D. Adequate intake of vitamin D can potentially reduce the risk of type 2 diabetes, but it is not yet known if whether correcting vitamin D deficiency in individuals with glucose intolerance can decrease the risk of progression to type 2 diabetes. Eating eggs at breakfast can help to control hunger and blood sugar levels. In one study comparing an egg breakfast to a bagel breakfast, those who had eggs for breakfast reported feeling less hungry throughout the day and lost 65% more weight. Protein slows digestion as well as glucose absorption. Hence the reason why good, lean protein should be included in all meal plans for people with diabetes. One study suggested that eating a higher fat, higher protein, lower carbohydrate breakfast may help to reduce blood sugar. One egg only has about 75 calories and no carbs. Hard-boiled eggs make an excellent calorie and carbohydrate controlled snack, allowing you to fill up on the protein without spiking your blood sugar. Remember when cooking that cooking an egg thoroughly is the best way to reduce the risk of salmonella food poisoning. It's probably not a good idea to consume raw eggs. Djoussé L, Kamineni A, Nelson TL, Carnethon M, Mozaffarian D, Siscovick D, Mukamal KJ. Egg Consumption and Risk of Type 2 Diabetes in Older Adults. The American Journal of Clinical Nutrition 2010. Linus Pauling Institute. Vitamin D.
Ratliff J, Leite JO, de Ogburn R, Puglisi MJ, VanHeest J, Fernandez ML. Consuming Eggs for Breakfast Influences Plasma Glucose and Ghrelin, While Reducing Energy Intake During the Next 24 Hours in Adult Men. Nutrition Research; 2010, 30:96-103. Vander Wal JS, Gupta A, Khosla P, Dhurandhar. "Egg Breakfast Enhances Weight Loss." International Journal of Obesity; 2008, 32:1545-1551.